Migrants queue inside a tent at the compound outside the Berlin Office of Health and Social Affairs (LAGESO) waiting to register in Berlin, Germany, Dec. 1, 2015. When a rubber boat capsized in Turkish waters in September, 17-year-old Mohammad and 3-year-old Aylan, both Syrian refugees, were among the dozens of passengers thrown into the sea. Mohammad survived, but Aylan’s body washed ashore and was captured by a photo that shocked the world. 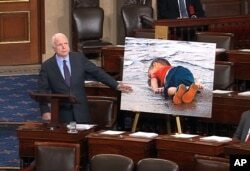 Republican Sen. John McCain displayes a photo of the body of a three year-old Syrian refugee during a speech urging stronger leadership from President Barack Obama on Syria, Sept. 9, 2015. Bundled in a soft cap and fraying coat last week in Germany, Mohammad is still a child himself. But as he waits for the papers that will allow him to start his new life, he says he has long given up his dreams. Mohammad tells his story in the reception area of a remote refugee camp surrounded by a tall, thick forest. Crowded around him are at least a dozen other young men, all Syrians who made the same treacherous journey. Many have heard Mohammad’s story before, but there’s little else to do. At least 11 other people drowned that day, Mohammad said, including Aylan’s mother and brother. More than 3,500 people have died trying to cross the Mediterranean Sea this year and many are children, according to the International Organization for Migration. Mohammad remembers how a wave crashed into the boat about a kilometer from shore, flipping it over and trapping the people. Frantically, some removed their life jackets so they could swim under the rubber edges of the boat. Some of those people couldn’t swim well enough to survive. Roughly five hours later, he said, authorities rescued many of the people and brought some of them, himself included, to jail for the night. I ask why it took five hours for the rescue. Weren’t smartphones on board? 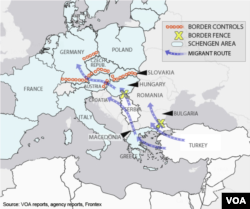 On the journey from Turkey to Greece, systems are in place to prevent accidents. Smartphones are packed into waterproof pouches so passengers can call for help. In the days that followed Mohammad’s crossing, people all over the world grieved for Aylan, and governments pledged to offer more support to help the hundreds of thousands of refugees fleeing the Middle East and Africa. Germany announced it could handle 800,000 refugees this year alone, offering hope to travelers, and to those who hope to travel. A safe route to Europe never materialized and scores of children have been among the drowned between Turkey and Greece since Aylan died. The United Nations children’s agency (UNICEF) says 190,000 children applied for political asylum in Europe in the first nine months of this year, twice as many as last year. And on the road to Europe in the days after the photograph went viral, said Mohammad at the camp, whatever compassion he saw on Facebook didn’t help him.